Many men perceive the actual physical journey to Russia as a daunting and somewhat intimidating experience. We offer these helpful travel illustrations and suggestions in an effort supporting the notion that, "An informed traveler is a more relaxed traveler." We believe that the specific information offered here should assist you upon your arrival in Moscow (you land at the International Terminal "SVO2" and must make your way to the Domestic Terminal "SVO1" located approximately 5 miles away) and aid your efforts when catching the connecting flight Moscow Airport (SVO2 and SVO1) on your way to visit Togliatti. 1) Upon arriving in Moscow you will disembark from your plane and immediately snake through a narrow hallway. Rather than "follow the crowd," we strongly urge you to run past the other people following the hallway until you reach a long flight of stairs that that will lead you to the Passport Control windows/booths. Whatever country you have arrived from, it is necessary for the Russian authorities to cross-reference and confirm that the visa you have received was officially issued by the Russian Federation. If more than one International flight has arrived at the same time, you can get caught up in a line that could take from one to two hours to negotiate. Many of our clients choose to purchase their connecting tickets once they arrive in Moscow, as there is an earlier flight departing for Samara Airport (KUF) at approximately 7:30PM, rather than taking the Aeroflot flight departing at 10:05 PM. It is for this for this reason, and the fact that standing in a long, slow moving line after spending hours on the plane ... that we suggest running to get in line at Passport Control. Having traveled to Togliatti many times, I can tell you that I have made it through this hurdle in less than 15 minutes when I sprinted off the plane and past everyone that I could on the way. 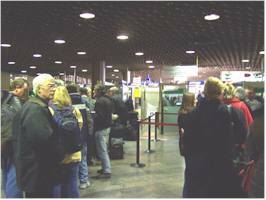 This process will provide your first impressions of Russia, and hopefully the lines will not be too long and your wait uneventful. The photo to the left is the stairwell that you must descend on your way to the Passport Control booths at Moscow Airport (SVO). 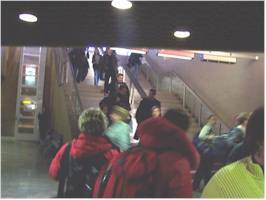 At times the lines are backed all the way up these stairs, resulting in a long, long wait for such unfortunate travelers. 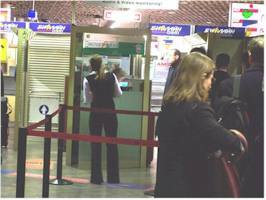 The photos below capture the lines leading up to the Passport Control booths. While there are four or five of these booths to service incoming travelers, these booths usually open up one-at-a-time over a period of 20 to 60 minutes. 2) The luggage carousels where you can claim your checked bags are located directly in front of the Passport Control stations. Walk forward approximately 30 feet and you are there. 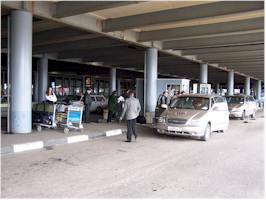 3) Once you have claimed your luggage you will need to pass through the customs line. There are two options here. The RED line is for those that have items to declare, or large amounts of cash (over $25,000). PLEASE NOTE: Small gifts for a lady(s) do not constitute items that must be declared. Neither are bottles wine or other liquors, pices of jewelry, etc.. You will be doing yourself a great favor by passing through the GREEN line. 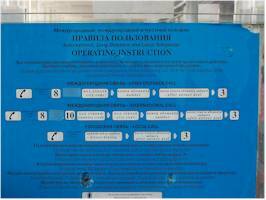 While you may be asked to have your bags pass through an X-ray machine, your official entry into Russia should be as painless as shuffling past the customs officials in an anonymous manner. 5) Luggage carts as pictured here are usually available and are free-of-charge. We suggest that the moment that you exit your Passport Control station ... you should look for and grab the first such cart that you see. 6) While American dollars and Euros can easily be converted to Russian currency throughout Russia, seldom will they be accepted directly for goods or services. Therefore, it is necessary to exchange some monies immediately upon your arrival. Pictured above is the bank-style currency exchange located on the ground floor of the International terminal (SVO2) where you will arrive. 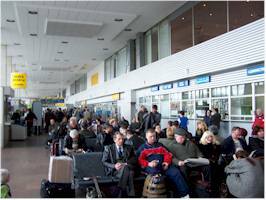 7) Your next step will be to catch a shuttle bus or the free Aeroflot bus to transport you from the SVO2 terminal to the SVO1 terminal (getting from the international terminal to the domestic terminal). Exit the ground floor and cross one driving lane, cross the first waiting island, cross a second driving lane, and arrive at the 2nd waiting island. The above left photo is where you will wait, and the above right photo is the view (distance) from the waiting island to the door where you exited the terminal. As you can see, it is a very short distance. 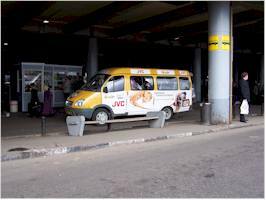 8) The mini-van pictured to the right is the type of shuttle bus that you will take. Look for a sign/card in the window that will say: SVO2/SVO1 or Sheremetyevo1/ Sheremetyevo2. The waiting time is usually no more than 15-25 minutes. Keep in mind that while this bus is quite colorful, the one you catch may simply be white. 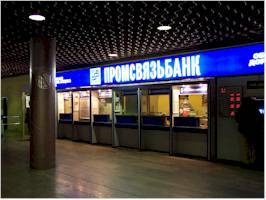 The fare is approximately 20-25 rubles (around 75 cents). The ride to the SVO1 terminal takes about 10-15 minutes. 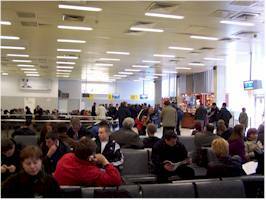 9) Once arrive at the SVO1 terminal, chances are better than not that you will have some substantial time to kill before your connecting flight to Togliatti departs. Unfortunately, the choices available on how you will spend that time are severely limited. 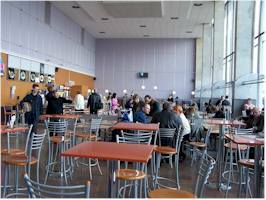 The photo below left is of the 1st floor cafe not far from the baggage and ticket check-in gates (this terminal is so small that everything is is close to the check-in gates). The photo below right reflects a viable 2nd (though equally boring) option. Sitting and waiting. 10) An option chosen by some brave visitors in an attempt to arrive 3 hours earlier posits an attempt to purchase tickets on the 7:05PM Samara Airlines flight arriving at the Samara Airport at 9:30PM (as opposed to the Aeorflot Airlines flight leaving at 9:50PM and arriving at 12:30AM (the wee hours of the night). The fact that the Samara Airlines tickets can only be purchased in Russia do provide some risk with this variant, though tickets on the Aeroflot flight are usually available if the Samara flight is sold out. 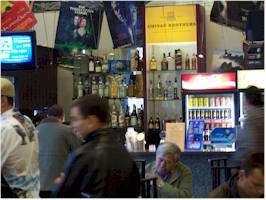 It is suggested that you purchase your Aeroflot tickets from SVO 1 (domestic terminal) on-line prior to departuring your home at www.aeroflot.ru. Prices are very reasonable ($60-100 each way) for this domestic trip from SVO1 to Samara when purchased 30 days in advance or more. 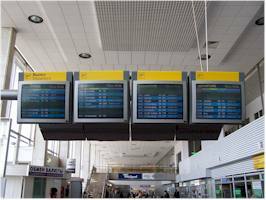 11 ) Clients choosing to purchase connecting tickets once they arrive at the SVO1 terminal must telephone the office in Togliati to inform our staff which flight will speed your arrival so we can pick you up at the airport. 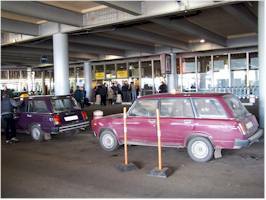 Samara Airport is approximately a 1 hour drive from your final destination in Togliatti. 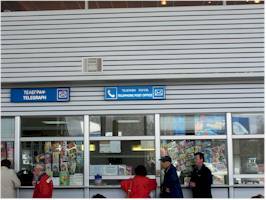 The two photos above show the actual window from which you will present approximately 50 rubles (less than $2.00) and inform the station attendant that you wish to telephone Togliatti. The photo below left is the actual telephone you will be directed to use, and the photo below right provides step-by-step instruction on how to dial and activate the call. Once you have completed the call, you can return to the station window for any monetary change you have left the the deposit that you have made. 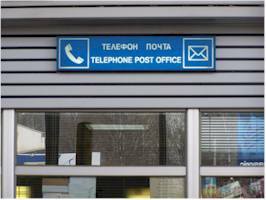 Once you are ticketed and have made the necessary telephone call to our Togliatti office (if necessary), you need simply to wait until such time as you can check your baggage. Check-in is usually called between 1 and 1.5 hours before your flight departure. Pictured below you can see that the actual flight schedule boards of departures are reflected in in a rotation between Russian and English (shown here). 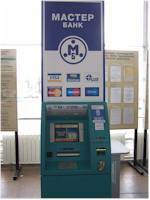 ATM machines do exist in Russia and most payout in Russian rubles. American and other foreign currency are not accepted directly for goods and services. Once you have checked-in your baggage, you will walk upstairs and your final boarding gate (#10) can be plainly seen. Relax, you will soon be boarding for the last leg of what has surely impressed you as a long journey. PLEASE NOTE: It is almost a certainty that you will be assigned a fee for the additional weight of your bags. 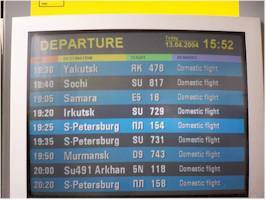 Domestic flights within Russia do not hold to the same generous weight allowances for checked and carry-on luggage (compared to international flights). 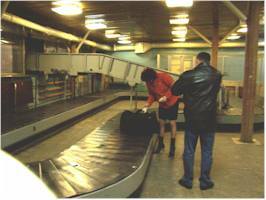 If the ticket agents find (at baggage check-in) that your bags are over the allowable weight limit (20 KG or 44 lbs), you will be presented a receipt that you must take to a cashier's station approximately 30 feet away, and then return to the ticketing station to prove that the weight overage has been paid for. Please dispel the notion that you are paying an additional fee (possibly $25 to $40) becasue you are a foreigner. The 90-minute connecting jet flight from Moscow to Samara is a commuter flight. Most passengers will be carrying a briefcase or small bag. Therefore -- someone traveling with 10-14 days worth of belongings should not act surprised when they are assigned the additional fee in question. The World Wildlife display above illustrates the popularity of all animals in Russia. 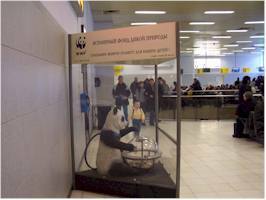 Donations are presumably utilized for wildlife preservation in Russia. Ample refreshments are at hand while awaiting for your final boarding call. 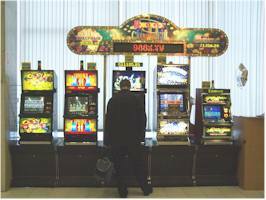 Casino machines are found throughout Russia, and the staging area for your final flight is no exception. 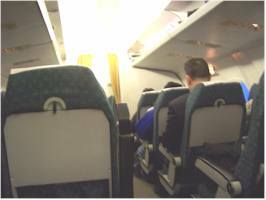 The two photos below were taken on the flight from Moscow to Samara Airport (SVO). 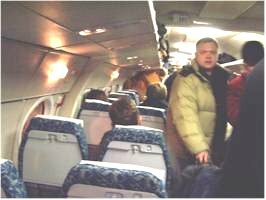 Many clients envision domestic Russian air-travel as a ride in a ramshackle prop-plane. While somewhat cramped, these jet seats approximately seventy (70) people, and the duration of the flight is one hour and fifteen minutes in the air. 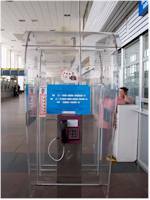 Concern over finding your luggage upon arrival at Samara Airport should be minimized. As soon as you disembark from the plane you are led to this single baggage carousel. No confusion here. At this point a Volga Girl representative will be waiting to greet you for your taxi ride to Togliatti. RETURN TO "WHAT'S NEW AND INTERESTING"